The perfect outdoor living space. A place to unwind, soak up the sun, and listen to your favorite playlists under the stars. Companies like Séura, Sonance, Lutron, Axis, and many others provide an exciting array of automated products for your pool deck or patio. With control of the outdoor lighting, music, and media choices at your fingertips. These smart-products seamlessly integrate into your smart-home network. Designing the ultimate space for relaxation and entertainment has never been easier. What do you need to create your perfect outdoor living space? Séura outdoor HDTV’s make a great centerpiece for a pool deck. They are wind, water, heat, and cold resistant. The outdoor displays are incredibly adaptive, adjusting to accommodate changes in lighting and weather conditions to ensure constant viewing optimization. 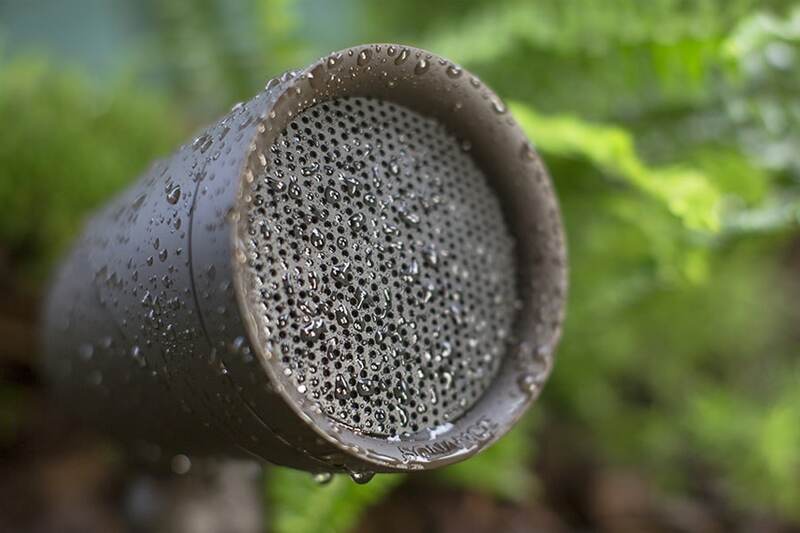 Séura’s outdoor soundbar combines carbon fiber woofers and titanium tweeters for consistently immersive sound. 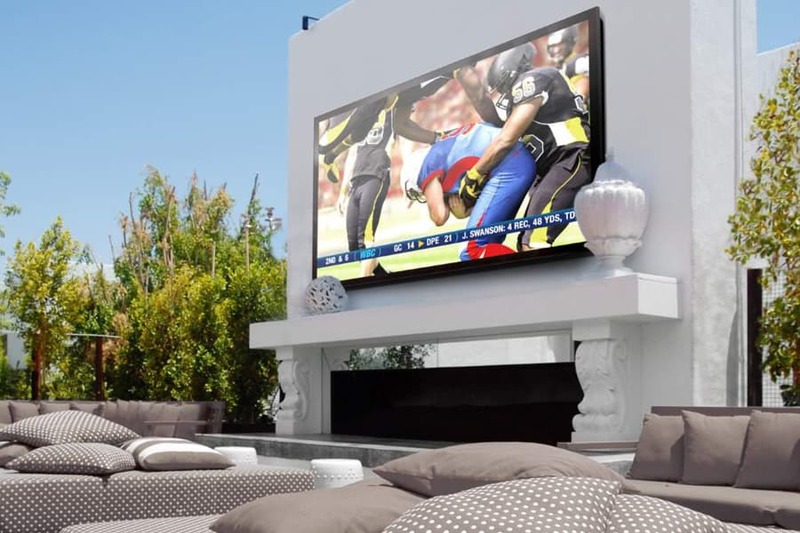 The Outdoor TV series from Séura delivers an incredible viewing experience for the patio all year round. Sonance speakers infuse sound into your outdoor living space from every direction. As you sunbathe in your garden sanctuary, you can soak up the sun and the music that feeds your soul. Fresh creative speakers that are heard, not seen. Innovatively designed, they blend into the garden, disappear under the vistas, and border walkways in sleek modern style. The speakers are all-weather with incredible hi-fidelity sound quality. Subwoofers hide underground to distribute sound evenly throughout. Sonance speakers are Alexa compatible, so you can change your playlist with voice command while soaking in the hot tub drinking an icy cocktail. Creating alluring outdoor ambiance is easy with Lutron Caseta lighting. Using pre-programmed scenes, exterior lights can be adjusted with the tap of your smart device as well as voice control. As the sun sets on your patio party, the pool deck and walkways illuminate on demand to embody the perfect atmosphere for your guests. Hayward Universal Colorlogic LED lights drench your pool with color as day turns to night. Choose from 10 rich colors including purple, blue, and green. Larger floor and wall lights fill the entire pool with the glow of your choice, while smaller accent lights highlight water features. Hayward’s Colorlogic line is 100% brighter than any other LED color light available and lets you change the color according to mood or event. With security cameras from Axis Communications, you can enjoy an evening of relaxing alone on your patio or hosting guests, without worry over unforeseen incidents. Axis cameras keep a 360-degree eye on the perimeter, so you can decide who joins you in your outdoor retreat. Savant Systems provides a network for security cameras, gate access, alarm systems, locks, and even a smart-doorbell. All simply controlled with the Savant App for your smart-device. Home security brings peace of mind so you can fully enjoy your outdoor living space. To create the ultimate outdoor living space, it is important not to neglect the systems that keep your pool clean and beautiful, and the garden looking its finest. Pool maintenance and yard irrigation systems are of absolute necessity. Companies that will keep your pool deck and patio looking perfect year round are Jandy, Autonomic, and HOL Vision. Time spent relaxing in the outside areas of your home should be free from concern over security, maintenance, or any interruption. Home automation exists to bring luxury and satisfaction to your life. With an automated outdoor living space, you can concentrate less on what goes on behind the scenes, and more on the ambiance and aesthetic of the space designed uniquely for you. ‘Responsive Living,’ the term coined by Acoustic Architects founders, Aaron Flint, and Spencer Hauldren, is the concept of seamlessly enhancing the client’s unique lifestyle using smart home technology. Responsive Living allows you to interact with your space via touch input, voice command, and predictive automation, placing you in full control of your home. If you would like to learn more about automation for your outdoor living space, feel free to connect with us. We will be happy to schedule a demo with you.